I’m kind of developing a crush on Simon Pegg because of this movie. I watched it last weekend in between marathon sessions of Viva Pinata: Trouble in Paradise and The Rachel Zoe Project. 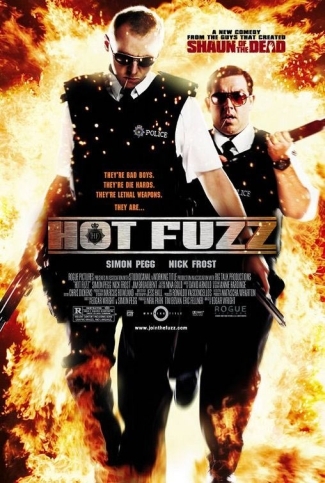 I never got around to seeing this or Shaun of the Dead until this week, and while I thought Shaun of the Dead was just okay I thought Hot Fuzz was one of the funniest movies I’ve ever seen. I’m sorry I didn’t watch it sooner. The idea of setting a buddy cop movie in a quiet little English village is twisted in all the right ways. It’s like Ben Stiller’s really good satires but with a wicked and decidedly English edge. And might I just mention that I find very few “comedies” actually funny in any way, but I find a good deal of what Ben Stiller does to be dead on hilarious (Zoolander, Mystery Men, Tropic Thunder)? So that comparison means I really, really loved Hot Fuzz. I may go watch it again right now. I am now waiting for the next Simon Pegg/Edgar Wright/Nick Frost extravaganza. I went searching on Rotten Tomatoes for reviews, and there was a quote from Peter Hartlaub of the San Francisco Chronicle that summed up my personality so perfectly that I had to include it in this post. I fell madly in love with the film.